Shoulders are critical joints, but most people don’t know much about how to keep them healthy. Strengthening with serratus anterior exercises will keep your shoulders mobile and strong, helping you avoid injury and live your active life. You may not know if you’ve got a weak serratus anterior. Hell – there’s a chance you may not even know what a serratus anterior is (we’ll get into that in a minute). But I bet you have an idea of how strong your shoulders are. If those shoulders have been feeling a little more on the weak side lately, your serratus anterior might be the key. This is especially true if you’ve noticed that your scapulae seem particularly visible. This is called scapular winging and, you guessed it – the serratus anterior is involved, as is the health of your shoulder as a whole. The serratus anterior is most recognized by its serrated-looking appearance along the side of your body. Depending on your body type and how shredded (or not) you are, it may or may not be visible. But regardless, these serrated points show the insertion point of the muscle on the ribs. 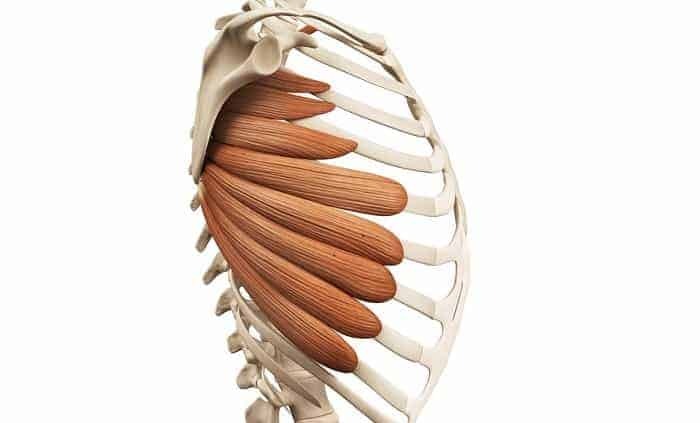 Your serratus anterior typically attaches to your first 8 ribs , but it lies deep to your pectoral muscles, so you won’t be able to see all of these “serrations” – even on a super lean body. From the ribs, your serratus anterior wraps around your side and back, where it runs underneath the scapulae and attaches there, to the underside of your shoulder blades . What Does the Serratus Anterior Do? Your serratus anterior plays a crucial role in how you move your shoulder and arm. It works to protract your scaps (wrapping forward around your ribcage) which controls forward pushing movements of your arms . This muscle also works with the lower and upper trapezius to rotate the scapulae upwards during shoulder flexion. But perhaps one of the most important functions of the serratus anterior is to posteriorly tilt the scapulae. Posterior tilt of the scapulae is important for healthy shoulders because it helps maintain the subacromial space. Without sufficient room here, any movement that has your arms at shoulder level or above may cause shoulder impingement and result in an irritated bursa or rotator cuff tendon. Thus, your serratus anterior provides a great deal of stability for your shoulder joint . Because your serratus anterior helps forward arm movements and provides a few more inches of reach to your punches, the muscle is sometimes called the boxer’s muscle. I remember teaching the function of the serratus anterior to a boxer I was training. I was showing him the basic Scapular Pushup exercise that you’ll learn below and he asked why not just train the regular Pushup. I told him it’s because we want to isolate the serratus anterior so I could see how it was functioning. “What’s the point?” he asked. “Pretend you’re hitting me with your jab,” I continued as I let him put his fist on my chin. Then I stepped back from his fist a couple of inches. “Now, protract your scapula,” I instructed and as he did as I asked, his fist again met my chin. Weakness in your serratus anterior can contribute to improper positioning of the scapulae, called scapular dyskinesis. This can happen in a couple of different ways. The scapulae may start to tilt forward if that serratus anterior weakness is paired with tight pecs and a tight deltoid. If the weakness is paired instead with additional weakness in the lower traps, the medial border of the scapula starts to flare up, or protrude – called scapular winging. When this happens, you can sometimes visibly see that medial border of the scapulae protruding up from the back, like wings. Sometimes winging might not cause any symptoms , and sometimes it can cause pain or weakness. But regardless, scapular winging is a clear sign that there are issues in the shoulder joint that need to be addressed with winged scapula exercises. And as I mentioned above, serratus anterior weakness can also contribute to shoulder impingement . By failing to properly control the scapulae, the amount of space in the shoulder joint itself can be reduced, leading to the “catching” of muscles and ligaments that characterize impingement. These 5 serratus anterior exercises all train the muscle in a different way so it can perform all of its functions effectively and keep your shoulders healthy. Every muscle in our body does more than just its strict anatomical action, so whenever we want to target a muscle, we need multiple exercises to do it completely. Otherwise, it’s kind of like letting your car get really dirty, then washing only one side of it. There’s no point in making ONLY the driver’s side of your ride look super fresh! Similarly, we don’t want to strengthen a muscle in just one area or for just one function – we want to build strength comprehensively for all of its functions, which is how to maximize movement longevity. This exercise trains serratus anterior control exclusively during strict protraction and retraction. This activator develops awareness of posterior tilt, then helps you train it. Use this move to train asymmetrical scapular motion – one scap will be protracting while the other is retracting. This drill will build scapular protraction during horizontal adduction. Use this rollout to focus on upward rotation of the scap during shoulder flexion. These serratus anterior exercises will strengthen an important muscle, improve the health and stability of your shoulders, and help you recover from or prevent issues like scapular winging. If you want to really dive in to shoulder and scapulae health, check out my Scap Control Program. You’ll uncover new levels of mobility and strength in the shoulder, which translates to new levels of ability in just about any activity you like to do – whether that’s MMA, CrossFit, baseball, or yoga. Click here to learn more about the program and what it will help you do. And in the meantime, give these serratus anterior exercises a try for a stronger more stable shoulder.